This charming hotel is located in Old City. There are a total of 64 bedrooms at Alahan. Those who dislike animals may enjoy their stay, as this property does not allow pets. This lovely hotel is situated in Ataturk Airport Istanbul. 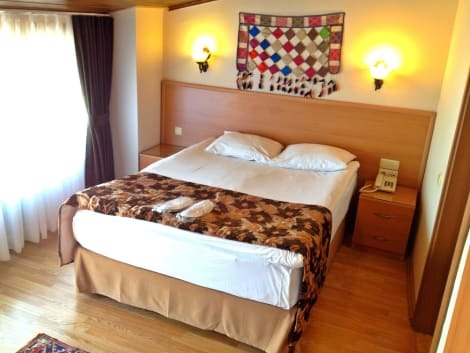 Visitors will enjoy a peaceful and calm stay at Caravan Palace Apart as it counts with a total of 3 bedrooms. This is not a pet-friendly establishment. Make yourself at home in one of the 14 air-conditioned rooms featuring minibars and LCD televisions. Complimentary wireless Internet access keeps you connected, and satellite programming is available for your entertainment. Private bathrooms with showers feature complimentary toiletries and hair dryers. Conveniences include phones, as well as safes and coffee/tea makers. 2 stars Emirhan Inn Apartment Hotel offers rooms and apartments located in Sultanahmet, close to Istanbul’s main tourist attractions. Comfortable apartments are fitted with LCD TV, hair dryer and free wi-fi plus a well-equipped kitchenette. Enjoy a continental breakfast each morning from the breakfast room, and in the evening a short stroll from the hotel will take you past many lovely restaurants and cafés to dine in. Situated in the historical area of Sultanahmet, Deniz Houses offers guests a glimpse into Istanbul’s rich history as well as its vibrant present. Set moments from the Blue Mosque, the rooms come with scenic views as well as en-suite bathrooms, free wi-fi, Plasma TVs and air conditioning. Staff at the 24-hour reception are happy to offer guidance on where to visit, and valuables can be left in a safe at the reception free of charge. Before heading out, enjoy a Turkish breakfast on the terrace. Grab a bite at one of the bed & breakfast's 2 restaurants, or stay in and take advantage of the 24-hour room service. Breakfast is available for a fee.